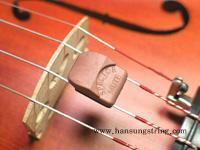 the spector mute offers violinists a mute at the ready! on the violin nestled between the a and d string. simply slide the spector mute back toward the tailpiece. available in traditional black and original copper.